That’s what He is. Faithful. We look back over our summer with wonder. We’ve been to the West Coast twice, driven nearly 10,000 kilometres, visited all of our family members, slept in over a dozen beds, and traveled by trains, planes, and automobiles (yes, even the Bolt Bus). But we’ve also seen the Glory of God and daily displays of His faithfulness. While driving West, we celebrated our 30th wedding anniversary at the Old Faithful Inn, in Yellowstone. 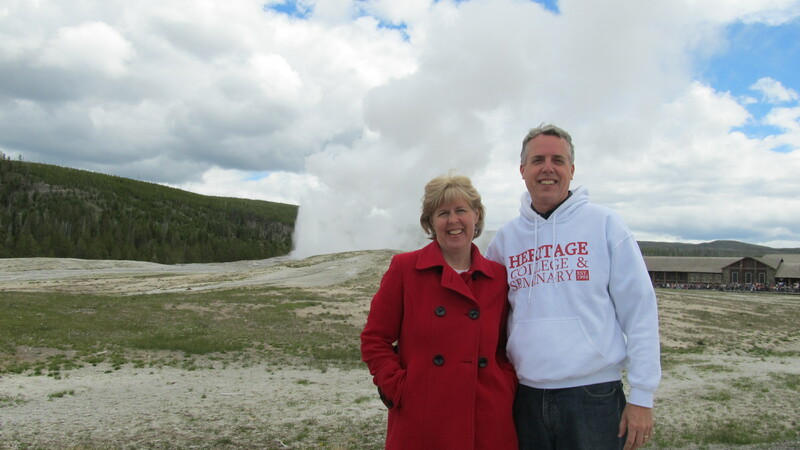 We watched Old Faithful erupt five times — the earth is groaning, but Old Faithful is still faithful. Every 90 minutes an expectant audience is counting on her faithfulness. We’ve seen a bit of rich and poor, and we’ve now walked through cancer and a few family funerals together. But together we’ve also seen the glory of a moose grazing in the Grand Tetons, ourselves in red blankets given by Maasai tribesmen, and others finding the Glory of God. Only because He is faithful, we’ve been able to walk faithfully. Wherever you are today, whatever challenges face you in the fall, can we encourage one another to just be faithful? We’re living in times of glory seeking, fun loving, self exalting. We all need to take up the challenge to “Dwell in the land and cultivate faithfulness” (Psalm 37:4). It’s then we’ll see the Glory of God.